1 of 3 Heat oven to 375 degrees . Coat a 15 x 10 x 1-inch baking pan with nonstick cooking spray. Line bottom of pan with wax paper and coat paper with spray. Set aside. 2 of 3 In a small bowl, whisk cocoa powder, flour and baking powder. In a large bowl, whip egg whites, cream of tartar and salt until frothy. Gradually beat in 1/4 cup of the granulated sugar until medium shiny peaks form, about 5 minutes. Set aside. With the same beaters, beat egg yolks, remaining 1/2 cup granulated sugar and the vanilla until pale and thick, about 4 minutes. Fold egg yolk mixture into whipped egg whites. Fold in flour mixture in 2 batches. Spread into prepared pan. Bake at 375 degrees for 12 to 14 minutes, until cake springs back lightly when touched. 3 of 3 Dust confectioners' sugar on a clean cotton kitchen towel. Run a thin knife around cake edges and invert onto prepared towel. Remove wax paper. Roll up cake and towel, starting from a short side. Let cool completely. 1 of 3 While cake cools, heat chocolate in microwave 1 minute, stirring until smooth. Set aside to cool slightly. In a large bowl, beat cream cheese and butter. Gradually beat in confectioners' sugar and vanilla. Spoon 11/2 cups of the cream cheese mixture into a medium bowl. Beat 1/2 cup of the heavy cream until medium soft peaks form. Fold into first bowl of cream cheese mixture to lighten. Beat melted chocolate, salt and remaining 1/4 cup heavy cream into second bowl of mixture. 2 of 3 Carefully unroll cake. Spread white filling to within 1/2 inch of edge of cake. Re-roll cake (without towel) and place seam side down on platter. Refrigerate 30 minutes, if very soft. Spread with chocolate frosting, using a fork to give the ridged appearance of bark. Top with chocolate shavings. 3 of 3 To create 'knot' on side of cake, place 3 marshmallows in a tight cluster on one side. 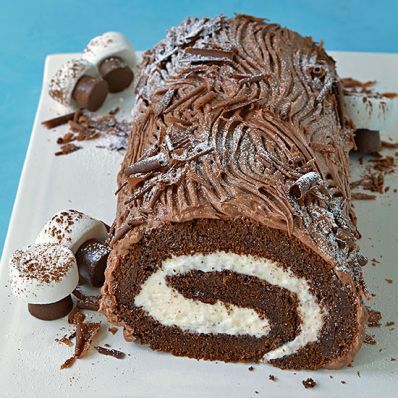 Cover with frosting, swirling decoratively. Add Candy Mushrooms to platter, if using. 1 of 1 Snip a marshmallow in half with scissors. Unwrap 2 Rolo candies and place a marshmallow half, cut side down, on top of each candy. Dust with a little cocoa powder. Repeat as desired.